Every day, throughout the far reaches of campus, SUU students engage in extraordinary opportunities. Some students participate in groundbreaking undergraduate research, others serve in the community or exhibit leadership skills through involvement in a student club, while many can be found diligently studying on the third floor of the Library. No matter where they are and how they get involved, SUU students are remarkable. Yet, too often a majority of these students never receive recognition for the contributions they make to the campus and community. The 65th annual Thunderbird Awards, set to roll out the red carpet in April, rightfully recognize student excellence in academics, athletics, involvement and service. However, this classy event, sometimes described as “the Oscars of SUU”, cannot happen without the nominations of students, faculty and staff. Kevin Koontz, a masters of public administration student and 2014 winner of the Personality of the Year award, encourages students to brag about themselves, even though it may feel uncomfortable at first. There are various awards given to students, faculty, staff, alumni and even community members during the event. Some are directly chosen by a department, college dean or athletic coach, but the majority of winners must be nominated by their peers to be eligible for the award. Mecham, who has assisted in the planning of Thunderbird Awards since 2008, said Professor of the Year is consistently one of the highest nominated awards. She hopes professors will recognize that and reciprocate by nominating their outstanding students. For a full listing of awards, rules and online nomination forms, visit suu.edu/ss/tbirdawards/. The annual awards ceremony will take place Saturday, April 18. 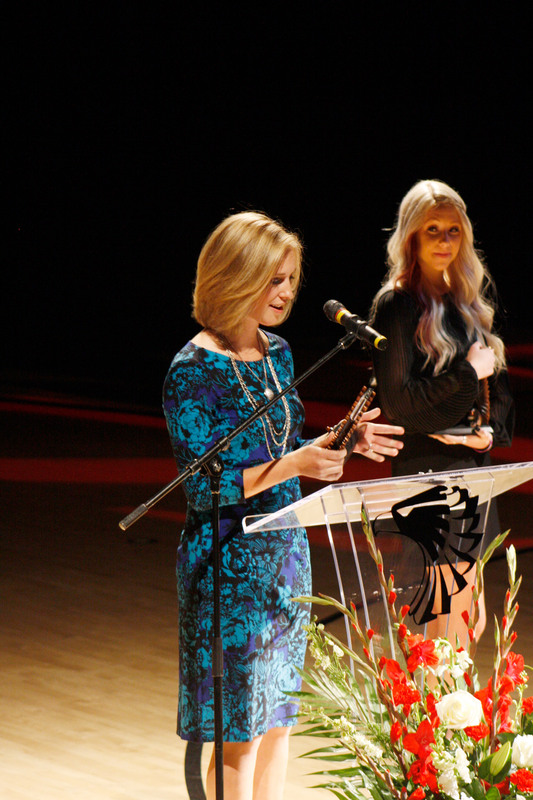 Photo Credit: SUUNews, Paige Gunn at the 2014 Thunderbird Awards receiving the Female Contributor Award.